Will Wright, the famed game designer behind SimCity, The Sims, and the yet to be released and highly anticipated Spore, flipped through pages of storytelling to an audience of all ears. Linking stories with the shift from passive to interactive media, Wright outlined the social and biological differences between games and film. While games utilize our basic instincts within the brain, film typically provides a rich emotional palette. Rather than push for the complete adoption of one or the other, Wright integrated the two into a cohesive experience. Relating to a computer mainly consisting of two parts, calculation and communication, Wright's games involve the possibilities of storytelling as well as the experience of sharing it. Wright explained that people enjoy playing with boundaries and then reporting back on their experiments, a theme that had been mentioned at an earlier panel discussing hacktivism and DIY culture. Most notably, this was seen in The Sims, which was regarded as a musical instrument of a game, where people truly became the storytelling tools. While expression plays a big role in gaming, it's just as significant that the computer also participates. In this sense, story-listening becomes just as active of a component as any other, teaching the computer how to listen to the player's story. While many love to share stories and content, there's always the issue of quality over quantity. Wright believes that by creating better tools, you can increase the quality of content in the community. 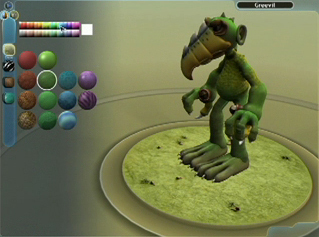 Example given was Spore, where users could create their own creatures in, what used to take Pixar artists several days, nanoseconds. Wright concluded that by making the player George Lucas and no longer the protagonist Sky Walker, the experience lends towards greater creative amplification and deeper interaction.